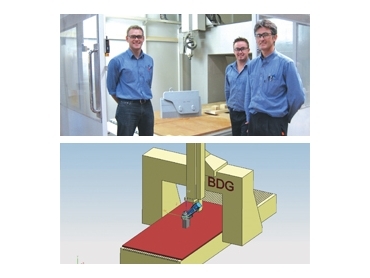 Recently, Bradken integrated NX with their new Australian-made BDG 605 five axis CNC, which they purchased from the machine tools manufacturer, BDG. Product Lifecycle Management then worked with Bradken to ensure integration of NX with the new machinery. The integration was seamless and easily accomplished. NX provides a fast, effective and accurate simulation of complex 5 axis toolpaths. “The combination of programming to the tool centrepoint, tool management and automated tool length presetting together with continuous head rotation greatly simplifies the task of generating effective and efficient five axis toolpaths. While other suppliers talk about the possibilites, PLM demonstrated the simple reality of five axis machining by getting inexperienced operators productive in a short timeframe,” said Mark Pivac, Director of BDG. BDG have been manufacturing 5 axis CNC routers for pattern making for seven years and have considerable experience with a number of CAD/CAM systems ranging from introductory level to fully featured top of the line systems. This past experience helped to integrate NX quickly with the BDG machine. The reality of five-axis machining is that it is a complex task. The CAD/CAM system and the machine have to work well together and simplifying every step leads to great improvements in productivity. It is true that some options for both CAD/CAM and 5 axis CNC machines seem expensive but the cost needs to be considered against the productivity advantage. For example, adding the option of continuous rotary axes does not just speed up the cycle time of indexing the axes, it simplifies some aspects of programming because the programmer no longer has to worry about adding safe retract moves prior to unwinding the axes or consider that a move could take the axis out of range. Adding the ability to programme to the tool centre point means that tool lengths only need to be entered at the machine and this removes the possibility of getting mistakes in the programming due to entering the wrong tool length in the CAM system. It also removes the requirement to post process the CAM files again if the tool length is changed, for example, after a tool sharpening or change. Realistic simulation of the programme prior to running it on the machine is beneficial. Even though the tool and toolholder is shown on screen during the toolpath creation, not all problems can be seen at this stage. The full NX simulation shows any modelled parts of the machine, even down to the coolant lines. With complex five axis toolpaths, this is a good to know that the parts of the machine such as the wrist or the back end of the spindle are going to clear the workpiece, when it is tried to machine in the deep valley of a complicated mould cavity. “From BDGs point of view, PLM quickly interpreted the requirements for the post processor and effective machining parameters. PLM quickly provided changes and test files during the debugging and prototype commissioning phase,” said Mark Pivac. “The NX training was very effective and efficient and has therefore reduced the time expected for programmers to be able to produce finished work,” says William Backon, Assistant Planet Engineer, Bradken.